Oil and gas development – from the drilling of the well to the disposal of waste – can have very real local impacts. For example, when the industry spills or leaks harmful fluids – whether toxic oil or salty, chemical-laden wastewater – the damage can last for decades. 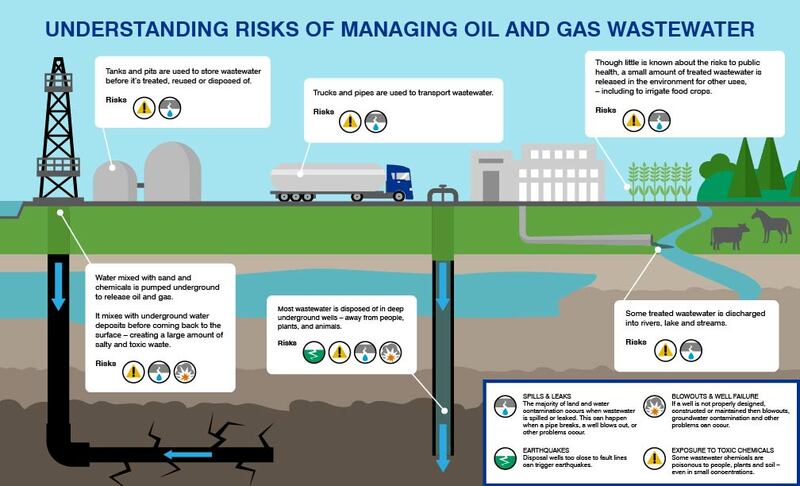 Much of EDF's oil and gas work is focused on reducing these risks to better protect the health and safety of the communities and ecosystems impacted by oil and gas development. We've helped enact rules that require well operators to disclose the chemicals and substances they add to the water used in the hydraulic fracturing process. The standards we promoted for well integrity — when adopted and enforced — protect the groundwater surrounding wells and the atmosphere above them. We're working collaboratively with scientists, regulators, and operators to develop a better understanding of oil and gas wastewater and management practices in order to improve the way we store, transport, treat, and dispose of it so that land, water, and communities are adequately protected. Still, there are important risks to land and water that have not been sufficiently addressed. EDF is working with diverse stakeholders to develop common-sense rules that will protect the local communities whose air, water and public safety are most impacted.